Please consult the Mass Schedule for Sunday and weekly celebrations of the Eucharist. For persons who are homebound and unable to attend Mass, please call the parish office and arrangements will be made for a Minister of the Eucharist to bring the Eucharist to you on a weekly basis. Please see our Homebound Ministry page for more information. It is the source and summit of all Christian life. In the Eucharist, the sanctifying action of God in our regard and our worship of him reach their high point. It contains the whole spiritual good of the Church, Christ himself, our Pasch. 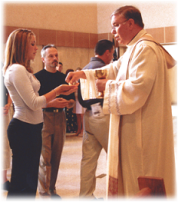 Communion with divine life and the unity of the People of God are both expressed and affected by the Eucharist. Through the Eucharistic celebration we are united already with the liturgy of heaven and we have a foretaste of eternal life. The unfathomable richness of this sacrament is expressed in different names which evoke its various aspects. The most common names are: The Eucharist, Holy Mass, the Lord’s Supper, the Breaking of the Bread, the Eucharistic Celebration, the Memorial of the passion, death and Resurrection of the Lord, the Holy Sacrifice, the Holy and Divine Liturgy, the Sacred Mysteries, the Most Holy Sacrament of the Alter, and Holy Communion. From the Compendium of the “Catechism of the Catholic Church“ #271-275.